OEM Aprilia Side Cases, White - CM257302 Standard Equipment on all '14-'16 Caponord 1200 USA models. This is the complete side cases set with mounting hardware in case your bike did not already come with these fitted. Tank Bag For CapoNord 1200 -2S000053. Official Aprilia Accessory. Tank Cover For Capo 1200 -2S000054. Official Aprilia Accessory. OEM Aprilia Rear Saddle Storage Bag For CapoNord 1200 -2S000050. Official Aprilia Accessory. Givi MonoKEY Trolley Base This sandwiched trolley base allows you to attach any Givi MonoKEY box and wheel it around like luggage. Finally, a super convenient way to carry around your top box when it's not on your bike. 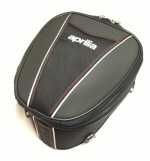 OEM Aprilia Top Box Bag for 52L Aluminum Top Box Bag for '14-'16 Caponord 1200, '16 Caponord 1200 Rally.